The evening kicks off at 5:30 p.m. at District Bar. Be sure to register on the Diva Tweet-Up Facebook group here. Look forward to seeing you there! Katy Lynch is the Community Manager of Where I've Been, the travel industry's leading social application. She manages the company blog, twitter, fan pages and the Where I've Been active travel community. Follow her on Twitter @whereivebeen. Shannon Smith is president of blueye, a local leader in web development, graphic design and social media applications. She's also the operator of Always Be Social, which places companies and individuals firmly into the social media realm and help establish a following . Follow her on Twitter @alwaysbesocial. Sarah Vargo , the original diva-owner of Maven LLC and publicist/promoter/socialite extraordinaire, was recently named one of the city's Top 5 Nightlifers to Watch by Chicago Magazine . 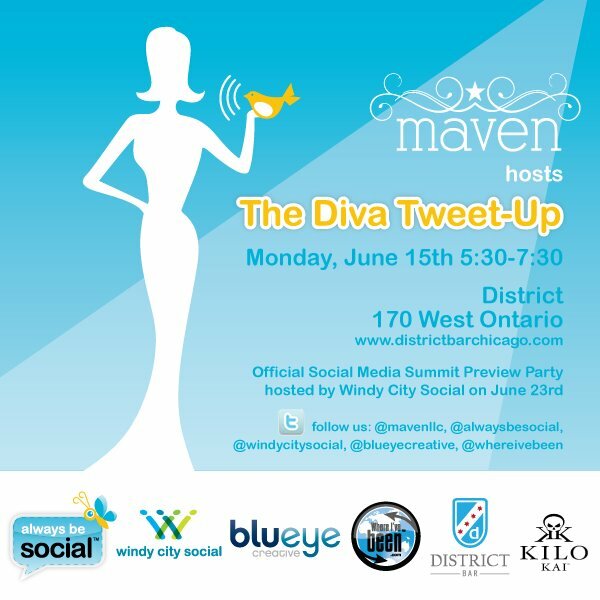 Maven has helped organize countless social events in Chicago since its inception, and this Monday's Tweet-Up is another event in her ongoing and successful Diva Series. Read more about Sarah here, and follower her on Twitter @MavenLLC. Hope Bertram founded Windy City Social, which plans networking events that connect the best and brightest in whatever venue best fits their professional, social, intellectual or physical needs. She's organized for everyone from local businesses to Fortune 500 companies. Follow her on Twitter @windycitysocial. We would absolutely love to see you all there. Don't forget to visit our Facebook group here to register and get more information. The event is also a pre-party warm-up for the Official Social Media Summit Preview Party, hosted June 23rd by Windy City Social.